James Sicily figures as the Hawks' chief kick-in option in 2019. The reliable Brown was the clearly the No.1 option for the Crows in kick-ins, with his 100 ranked sixth in the League despite missing two games. He was a long way ahead of utility David Mackay, who split his time between wing and half-back. Brown's numbers were higher than usual due to defender Brodie Smith missing all but two games of the season with a knee injury. The Crows only played on 20.8 per cent of the time – 13th in the AFL. WILL IT BE THE SAME IN 2019? Only Sydney's Jake Lloyd and West Coast's Shannon Hurn took more kick-ins than Witherden in 2018. The clever Lions half-back took the responsibility just under 50 per cent of the time following a behind. Although very adept at kicking the ball back across his body into the corridor, Witherden became more circumspect as the season wore on and often took safer option. He also played on more than 40 per cent of the time. Brisbane was also happy for its most penetrating kick, Daniel Rich, to start its chain of possession. Kade Simpson has long been Carlton's preferred defender to bring the ball back into play, with his 'Kade Fade' brought to prominence last season. That sees Simpson feign to kick to the right, before quickly shifting the ball to his dominant left side where a fellow defender normally blocks the man on the mark. The Blues went short almost double the amount they went long last year, mostly wide to a pocket. Lachie Plowman was behind Simpson as Carlton's most prolific from kick-ins, given more responsibility due to Sam Docherty's ACL injury. Veteran full-back Lynden Dunn would have held a virtual monopoly on Magpie kick-ins had he not suffered a season-ending knee injury that restricted him to just 14 of a possible 26 games. The vast majority of Dunn's efforts were made to order, either hitting a target or landing well outside scoring range. In his absence, fellow defenders Jeremy Howe and Brayden Maynard also proved good options with their decision-making, precision and power, with two-thirds of the Pies' overall kick-ins rated effective. They tended to go short to the left back pocket. Conor McKenna led the Bombers for kick-ins last year, getting the ball back into play on 79 occasions after a behind. Essendon is happy to give the Irishman that responsibility, and he largely shared it with Brendon Goddard last season, who is now retired. McKenna took the ball out of the goalsquare and kicked to himself 47 per cent of the time he took the kick-ins last season. Fremantle coach Ross Lyon trusted second-year backman Luke Ryan to split the bulk of kick-in duties with superboot Nathan Wilson last season, and they usually searched for a short target to hit. The Dockers rarely played on from a kick-in, when more often than not the plan is to take territory and look for a big man outside defensive 50. Freo wasn't exactly oversupplied with reliable marking targets last year, so it was an understandable approach. Tuohy was the predominant kick-in taker for Geelong, ranked 11th in the AFL in that category. His reputation as a powerful, long kick tended to translate into the way he approached kick-ins. In the second half of the season, the Cats made an adjustment to the way they played and that meant targeting the corridor more often. Between rounds 15 and 23, the Cats used the corridor from rebound 50 26.6 percent of the time (No.1 in the AFL). Tom Stewart often played on from the goalsquare and kicked long to tall targets – sometimes Mark Blicavs isolated against a smaller opponent. It was pretty simple for the Suns last season – May kicked it long and Harbrow kicked it short. The two experienced defenders were responsible for more than 50 per cent of Gold Coast's kick-ins and statistics showed than Harbrow playing on, followed by a short kick was its most effective strategy to transition the ball from the defensive 50. May often took the safer route, pumping the ball long down the line to create a contest. Shaw and Finlayson, along with Lachie Whitfield (55), are three of the Giants' best kicks, so it was little surprise to see them lead the team last year. Shaw kicked to himself and played on 57 per cent of the time, mostly looking at long options, while Finlayson and Whitfield preferred to pinpoint their kicks in the corridor. Sicily was the Hawks' clear top choice when he played, but his six-match absence recovering from a broken wrist saw Burton overtake him, with 36 of the club's 61 kick-ins during that period. 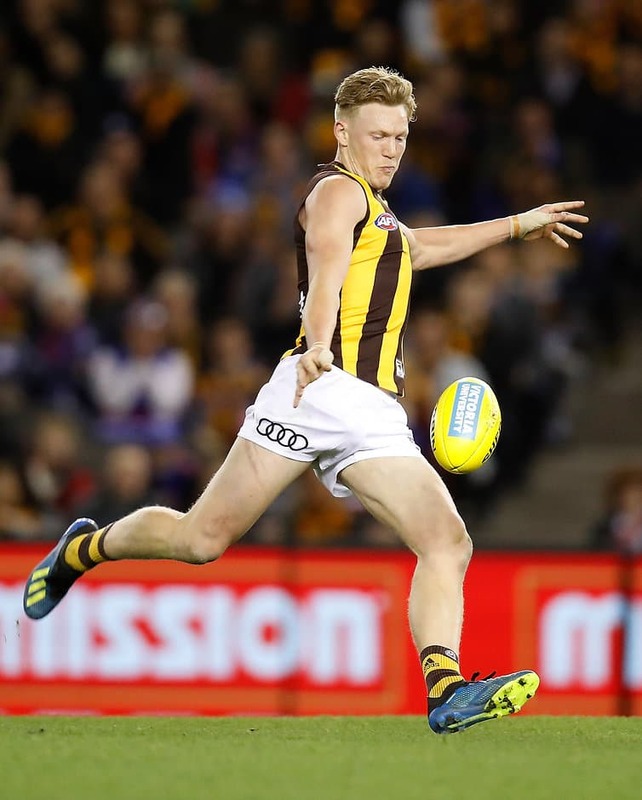 Burton generated the third-most scores (10) – behind Tiger Jayden Short (14) and Kangaroo Scott Thompson (11) – while Blake Hardwick (seven, equal 17th) and Sicily (five, equal 26th) were also prominent. Hawthorn, which typically went down the middle or to the right, was a strong-performing kick-in side overall, with the second-most goals (19) and scores (27) from kick-ins and the seventh-fewest scores conceded (42). The Demons tended to trust two of their most experienced players to bring the ball back into play in 2018. Lewis focused on hitting short targets, with 66 of his total 72 kick-ins classed as effective by Champion Data. The four-time premiership Hawk is one of the Demons' best users by foot, alongside Christian Salem and Bayley Fritsch, so it's little surprise he excelled in this area. Thompson (equal 13th in the AFL) and Macmillan (18th) were clearly North's preferred options at kick-ins last season, but brought contrasting styles to the crucial role. While Thompson played on from only eight per cent of his kick-ins, Macmillan did so 27 per cent of the time. Thompson's kick-ins were extremely effective, however, starting scoring chains that resulted in a League-high nine goals, compared to two goals from Macmillan's kick-ins. As a team, North led the competition in effective long kick-ins and were ranked fourth for scores from kick-ins despite playing on from only 17 per cent of its kick-ins (16th). The Power didn't have a designated player for their kick-ins. Defenders Dan Houston (77 in 22 games, 3.5 per game) and Riley Bonner (66 in 19 games, 3.47 per game) shared the duties. Houston ranked 16th overall while Bonner was 22nd. The Power were a middle of the road team when it came to playing-on from kick-ins, taking that option 25.4 per cent of the time. Houston did that more than most of his teammates, playing on with 32 per cent of his kick-ins. It's not hard to see why Short was heavily used from kick-ins last year. His unexpected form surge and booming kick made him an obvious candidate to take the role. Among those closely behind Vlastuin in second on the list were Brandon Ellis and Bachar Houli. While the Tigers' backline is very sound defensively, Short is the obvious option to bring the football back into play, considering how accurately he delivers the football. Injuries affected both of these players last year. A torn hamstring prematurely ended Savage's campaign while Webster was limited to 17 matches after dealing with groin problems. If Dylan Roberton hadn't suffered a heart issue in round four, he likely would have shared duties with Savage and Webster. The long kicking Savage offers and the accurate left boot on Webster means they took the bulk of the work after an opposition behind. Despite having reasonable pace, Savage played on from kick-ins just seven per cent of the time – the third-lowest of the top 30 in the competition. Lloyd was ranked No.1 in the League last year where his cool head made him an effective kick-in taker for the Swans, with a short option his most preferred option, with fellow half-back McVeigh also a safe bet with his outstanding foot skills. Both players looked to hit up an option in the corridor if possible which caught Lloyd out on a few occasions if he missed the kick at the SCG. Premiership skipper Shannon Hurn loved to kick to himself (he played on from 41 per cent of kick-ins) before scurrying away – almost always to the right-hand side back pocket – and bombing the ball as far as he could from the danger zone. With a host of big men to aim at – think Nic Naitanui, Nathan Vardy, Scott Lycett, Jeremy McGovern, Josh Kennedy and Jack Darling – it was an effective ploy and helped stretch defensive zones to open gaps for shorter kicks, where the Eagles could retain possession and spread the field with their elite ball use. Dashing defender Johannisen is an elite ball-user and led the total kick-ins for the Western Bulldogs in 2018, but his tally of 53 was the lowest number to top a club’s list. Given second-placed Bailey Williams and third-placed Matthew Suckling both averaged more kick-ins per game in less appearances due to injury, a case of circumstance as much as tactics might have played a part in handing the responsibility to Johannisen. Sharing the role certainly didn't deter senior coach Luke Beveridge from attacking on the last line – the Bulldogs ranked first in going through the corridor.